Andrew was appointed as the Vicar of St. Andrews on October 1st, 2018. Andrew is active in music ministry and in ministry to children and youth. 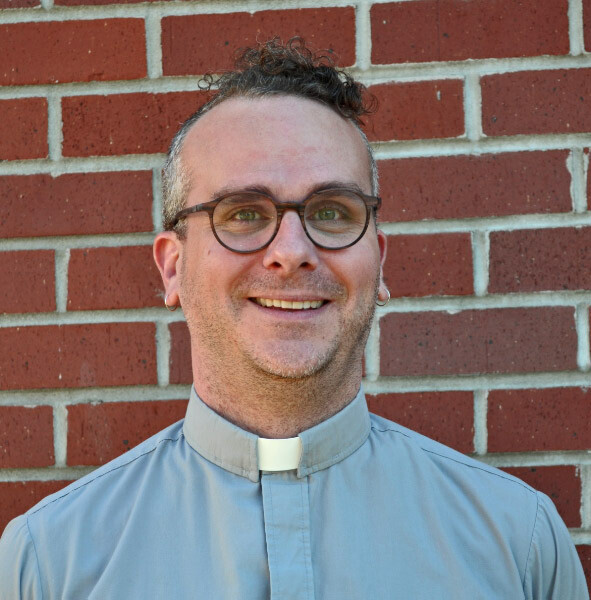 He is the ringleader of the Diocesan Arts Ministry, is the leader of the Diocesan School for Parish Development, an Anti-Racism trainer, and can be hired out as a parish consultant. Andrew did his theological training at the Vancouver School of Theology, graduating with a Master of Divinity in 2007. He also holds a Bachelor of Arts degree from UBC and a Master of Arts degree from UNBC in Prince George, with training in Political Science and Women’s Studies. Andrew holds a Life Skills Counselor Certificate and has trained in Mental Health First Aid with the CMHA. He is a certified MBTI practitioner. Outside of ordered ministry, Andrew has worked in a funeral home, at a dance studio, in hotels and conference centers, and as a Suzuki violin teacher. He is choral singer and a musical theater performer, and loves to read and ski.